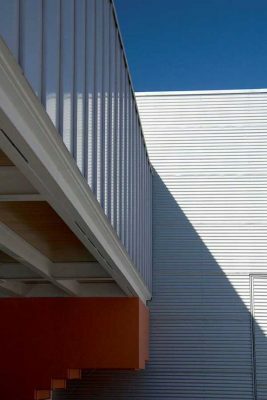 After the success of the reforms done to their main store in 2002, the company decided to build a structure that, for the first time, was designed specifically for its large storage, offices and sales requirements. 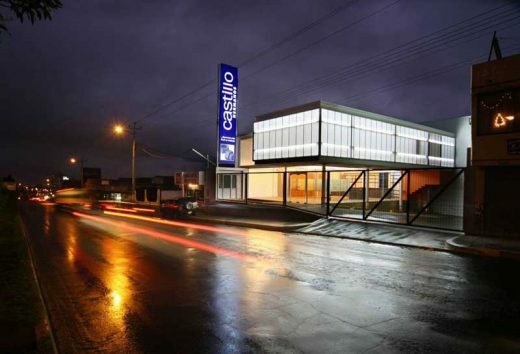 A site was chosen, located at the south end of the city on the main access route to Quito, in an area that is chaotically consolidating with multiple uses. The project is defined by the location of the storage space and the truck access and car parking, trying to minimize the footprint of the building, opening up the space at the front and side of the lot offering an alternative to the dense front occupation and urban decay of the district. 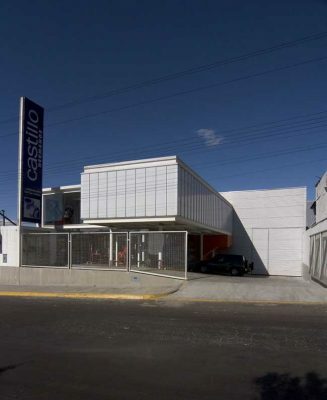 The structural design and choice of materials strive to take the weight off the building, since it had to occupy a high percentage of the lot, by means of a cantilevered structure and by using different degrees of transparency, during the day to control sunlight, and at night to appear like a large display case or a lantern that attract the attention of passers by to the store.